To be mindful is to be aware of your present moment experience with attitudes of acceptance, friendliness and curiosity. Research indicates mindfulness training improves health outcomes in patient populations. In addition, healthcare providers trained in mindfulness report reduced stress, burn-out, depression and anxiety. They describe increases in self-awareness and an improved ability to listen and respond effectively to patients. Learn about Carolyn’s training programs for professionals and her research blog. Mindfulness training offers a practical approach to living life fully with all its joys and sorrows. It helps us respond to life’s challenges with stability and skill and discover our innate capacity for wisdom and love. Being mindful enables us to thoroughly enjoy and appreciate the goodness in our lives. 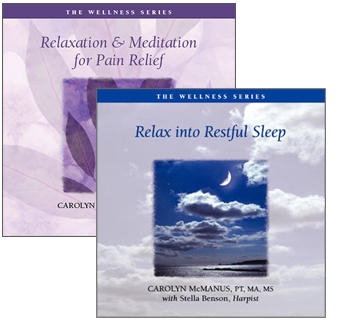 Learn about Carolyn’s training programs for the public at Swedish Medical Center and the VA.
Carolyn integrates her experience in mindfulness, physical therapy and rehabilitation in these popular guided recordings that enable you to develop your mind-body relationship, quiet a busy mind, and achieve states of physical relaxation and mental calm. They make the process of learning to relax or meditate easier for beginners. For those with previous experience, they add to and advance your practices. Receive a quarterly newsletter highlighting Carolyn’s mindfulness training programs for rehabilitation professionals and the general public.